I happen to own one of these super-nifty GPS-tracking devices. Which is probably why I’m sold on its foolproof ability to track down my min-pin whenever he makes his escape. This sturdy device clips onto Gaston’s collar and lets me know (via email and mobile) whenever he strays. Using the Tagg website or smart phone app, I can follow his movements and nab the little guy before any harm befalls him. What’s more, this GPS tracker doubles as an activity monitor to keep track of how active your pet is on a day-to-day basis. As such, this feature makes it a great adjunct to any weight loss program and can even tell you when your pet isn’t feeling great long before any other signs of illness. This is a new service for me. Hence, the mere 14-day timeline and the gap between the 11th and 13th when I forgot to re-charge the device. (I'm getting better at it, I promise). In any case, at $99 with a monthly service fee of $7.95 for both GPS and Activity Tracking services, it’s a bargain. From the people who bring you useless devices you just can’t live without comes the one item I can actually recommend. 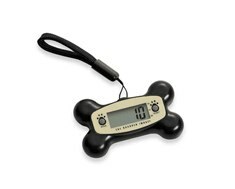 This device clips to your pet’s collar and counts steps, calculates distance, and tracks calories. And at only $19.99, it’s 100% guilt free. The favorite of canine geneticists, this “mutt test” is the pick of the litter. For $99, it pinpoints your mixed breed dog’s predominant breeds. It may not seem like a "healthy" gift, but because it might soon be accepted as a legal means of proving your mix doesn’t hail from a banned breed, it most certainly could qualify as life-saving in some cases. In a large bowl, whisk together the flour, wheat bran, and both kinds of parsley. In a small bowl, lightly beat the egg with peanut butter and appleasauce. Add liquid to dry ingredients. Mix well. Add some water if the dough is too firm. Add some more flour if too soft. Spray a cookie sheet with non-stick spray or line with parchment paper. Scoop the dough onto the prepared baking sheet in rounded teaspoonfuls. Turn off the oven and let the cookies cool in the oven for a couple of hours. This crisps them up. This yields 20 to 30 homemade dog treats. They keep for a month in an airtight container or up to six months in the freezer. Sign up with your email address to receive the Dr. Khuly's columns and posts in your inbox. © 2017, Dr. Patty Khuly. All Rights Reserved.